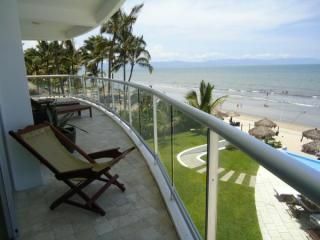 Ocean View Condo For Rent "KITE II"
and beautiful pool. All furnished and ready for you to spend the most relaxed and joyful vacations you can imagine. Located close to great restaurants, casino, grocery store, etc.. Great staff and secure (security guards 24 hours seven days a week). Space for one vehicle. 1 Bed, 1 Bathroom Queen size bed Standard size sofa bed A/C Satellite TV Fully equipped kitchen Washer and drier One parking space Private beach Pool etc. This condo is exactly as it is described. The grounds, and security are great. The condo has everything you need. The balcony is shared, and we were lucky to have a good neighbour. Hope to soon return ! My husband and I spent 8 nights in this ocean front unit at Kite II. We found the unit to be consistent with the online description. The complex is well-run with security and maintenance personnel. The condo itself was very clean and well equipped with ocean toys including boogie boards. The owner responded quickly to a minor issue that was promptly resolved. We found it comfortable for 2 adults but probably 4 adults might find it small especially as the deck space is limited. However, a family with 2 children could work fine as most of the time is spent at the nice pool and adjacent beach. The owner was also accommodating when we asked for a little extra time on check-out (although I realize this is not always possible with other incoming guests). We will consider renting this unit in the future. Loved, loved, loved our holiday!!! Our stay at Kite was amazing. We were so impressed with our suite and most of all our view. The suite was well stocked with everything we needed and it was fantastic to be right on the ocean. We loved leaving our doors open and listening to the ocean. The pool was right there as well so we had a choice of sitting on the beach or at the pool. We never had to rush out to save chairs in either spot and both areas were never packed with people so very nice and relaxing. The complex was well staffed and always spotless. The people at the gate were always so helpful as were all the staff onsite. With it's convenient location we could walk out to the bus stop and go where ever we wanted. We stayed for 2 weeks and didn't have to rent a vehicle. The path all the way from one end to the other end of Nuevo was great for walking or biking. Our Neighbor and owner was amazing and took us under her wing to show us the best time from taking us to the market, out for dinner and Salsa dancing. Anytime we had any concerns or questions, we would email the owner and always received a quick response. I would recommend staying at this resort whether you are there for one week, one month or more. We spent 23 wonderful days in this condo, everything was Wowww !!! The condo is clean, very well equiped, the view is amazing , the sunset are breathtaking, the owner Laureano takes time to answer all you questions and he respond very quickly, the place is so well maintain, garden, pool, beach.. security make sure everything is alright, the location is perfect, close to restaurants, market, Taxi ride for farther restos is about 5 $ , will we return ??? YESSSS we will be back next winter !! We have travel a lot and this is THE PLACE for us !!! See you next winter KITE II can't wait to go back !!! It was a pleasure having you in our Condo. Thank you! Torres Kite II to is a lovely vacation setting. The infinity pool area is really relaxing with good acess to a gteat beach with palapas and lots of good people watching. This is a fairly compact unit with a relatively small balcony but the second floor location looks over the pool and the beach and is great for sunsets. Minimum stay is one week. Ask for better prices if you plan to stay 3 months or more.